I seek in anonymity’s cloister, not him who ate the first raw oyster, but one who, braving spikes and prickles, with infinite patience and fortitude, unveiled the artichoke as food. With all due deference to Ogden Nash’s famous poem, I would have to include grape leaves among those comestibles that don’t immediately advertise themselves as edible. Granted, a grape leaf is vegetative. But all similarity to salad ends there. To my way of thinking, you’d have to be pretty desperate to see dinner in a bunch of grape leaves. And yet, a grape leaf stuffed with rice, pine nuts, currants and other goodies has become an iconic menu item in certain parts of the Mediterranean. 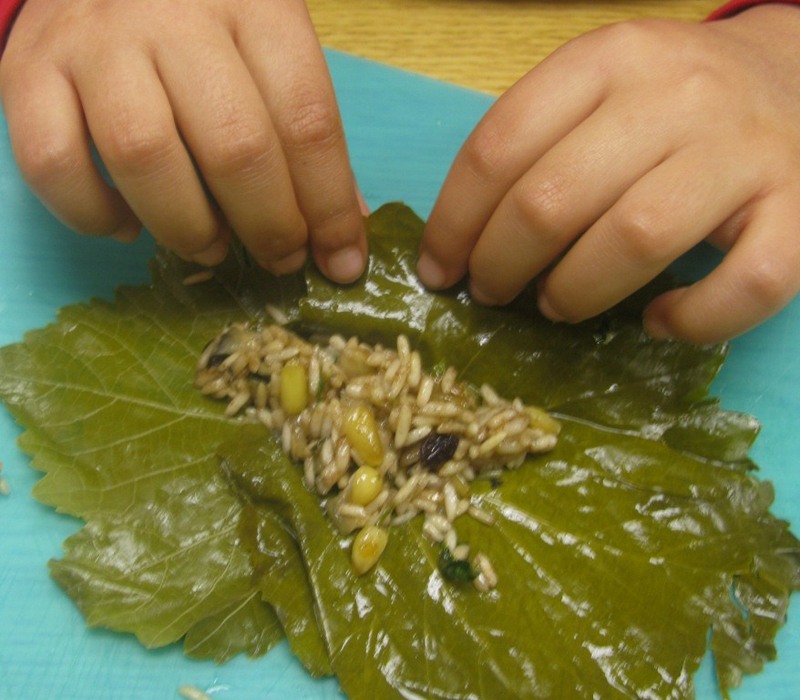 And so it was that as our food appreciation classes crossed over the waters from Greece to Turkey, we took on the famous dolma, or stuffed grape leaf. What we learned is that the hardest part of stuffing a grape leaf is getting the grape leaves out of the jar. Indeed, we were able to locate grape leaves in jars at our local Harris Teeter. What a relief. After that, it was simply a matter of settling on a recipe, most of which call for par-cooking rice, mixing it with the aforementioned pine nuts and currants, rolling the leaves around the stuffing, then cooking these little green logs in shallow water until tender. Rice seems to be the classic stuffing. But as my wife points out, when dolmas are overcooked–as they so often are–the rice gets pretty mushy. She prefers to make them with couscous. And come to think of it, there’s no reason you couldn’t use other types of grains, such as Bulgar or quinoa. Why not experiment? But keep in mind that the grape leaves have to be thoroughly cooked before they are tender enough to eat. I cannot vouch for any other grain stuffing except the rice variety we made in our classes. And you know what? That absolutely works. But you have to shake hard. We found that two leaves, overlapped at the stem ends, created just the right size for rolling. But first you’ll need a stuffing. Start by sauteeing 1 medium onion, cut into small dice, in 3 tablespoons extra-virgin olive oil. Season with salt and cook until tender, about five minutes. Add 1 cup rice and a small handful of pine nuts and continue cooking over moderately low heat until the rice turns bright white and the pine nuts are lightly browned. Add a small handful of dried currants, a fistful of chopped parsley leaves and 1/2 cup water and continue cooking until the water has been completely absorbed. This shouldn’t take more than a few minutes. Set the stuffing aside to cool, then stir in 2 teaspoons dried mint flakes, 1/2 teaspoon allspice, 1/2 teaspoon sugar, a generous grind of black pepper, a pinch of cinnamon and the juice from 1/2 lemon. Spoon a heaping tablespoon of stuffing onto a pair of grape leaves overlapped at the stem ends (remove any tough stems). Shape the stuffing into a thick log, then begin rolling, first folding over the end nearest you, then folding the sides inward. Pull the leaf snug as you roll. You should end up with a nice thick cigar about four inches long. When you’ve used all the stuffing, arrange the dolmas in a single layer at the bottom of a heavy pot. Pour in 1 1/2 cups water and cover with a pot lid that fits snugly inside the pot. This will help the dolmas steam. Bring the water to a boil, then lower the heat and simmer until all of the water has been absorbed and the rice is tender, about 50 minutes. 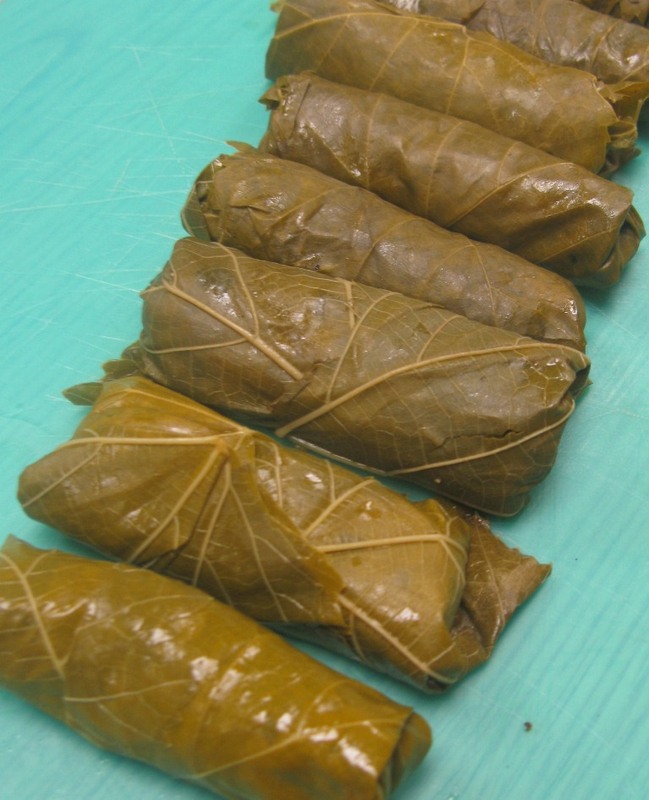 You’ll know immediately if you haven’t cooked the dolmas long enough: the grape leaves will be tough and stringy, and the rice will still have a crunch. Definitely cook them some more until they are done to your liking, adding more water if necessary. Then it’s your choice whether to serve them hot, warm, room temperature–or even cold out of the fridge. They make a great snack.